Objectives: The SYNTAX score is a grading system that evaluates the complexity and prognosis of patients undergoing percutaneous coronary intervention (PCI). We investigated the association between the incidence of major adverse cardiac events (MACE) following PCI and the SYNTAX score in patients with three-vessel disease. Methods: We consecutively enrolled 381 patients with three-vessel disease undergoing PCI and stenting. The SYNTAX score was divided into tertiles as low (≤16), intermediate (16-22) and high (>22). The endpoint was the incidence of MACE defined as cardiac death, in-hospital mortality, nonfatal myocardial infarction (MI), or target vessel revascularization. Then, the incidence of MACE was compared among the SYNTAX score tertile groups. Results: The median follow-up was 14 months, and the rate of MACE was 12.6%. The rates of MACE were 7.5%, 9.9%, and 21.6% in patients with low, intermediate, and high SYNTAX score tertiles, respectively. Higher SYNTAX scores significantly predicted a higher risk of MACE (hazard ratio = 2.36; P = 0.02) even after adjustment for potential confounders. The main predictors of MACE were SYNTAX score, advanced age, hyperlipidemia, presentation as recent ST-elevation MI, number of total lesions, and history of renal failure. Conclusion: The SYNTAX score could predict major cardiac outcomes following PCI in patients with three-vessel disease. Due to the increasing number of patients being treated for CAD every year and the importance of risk stratification and prognostic evaluations, different assessment modalities have been developed to evaluate the patients' risk and predict their outcome following therapeutic intervention. One of the most important scoring systems that have been designed to date is the SYNTAX score. The SYNTAX score is an angiographic tool to help cardiologists, interventionists and surgeons to grade the complexity of coronary artery lesions. A higher SYNTAX score indicates a more complex condition as well as worse prognosis in patients undergoing contemporary revascularization especially with PCI. However, its value for predicting early and late mortality and complications is still a question mark. Although some authors have reported an acceptable predictive power for the SYNTAX score concerning major adverse cardiac and cerebrovascular events following revascularization, there are still few precious data on its predictive value for early or late mortality. Some others have confirmed the usefulness of this score to predict cardiac mortality and adverse events in patients undergoing PCI on the left main coronary artery. , Nevertheless, published data on the use of appropriate scoring systems for predicting clinical outcome of PCI and stenting, especially in the treatment of three-vessel involvement are relatively limited. In the present study, we investigated the association between the incidence of major adverse cardiac events (MACE) following PCI and the SYNTAX score in patients with three-vessel disease receiving treatment at Tehran Heart Center. We hypothesized that the SYNTAX score could effectively predict the outcome in CAD patients undergoing PCI. All consecutive candidates for PCI of with either a drug-eluting stent (DES) or a bare metal stent (BMS) between January 2007 and December 2009, at Tehran Heart Center, were enrolled in this single-center retrospective cohort study. Patients were enrolled if they had three involved coronary arteries (three-vessel disease and >50% occlusion) and were excluded in case of age <18 or >80 years, primary PCI, prior revascularization therapy, either PCI or coronary artery bypass grafting, or left main stenosis >50%. An informed consent was obtained from all of the participants at the time of admission. The committee of medical ethics and the research board of our center approved the proposal of this study. This study conforms to the principles outlined in the Declaration of Helsinki. The SYNTAX score was derived from the summation of the individual scores for each separate lesion defined as ≥50% luminal obstruction in vessels ≥ 1.5 mm. The SYNTAX scores were calculated for all patients using dedicated software (available at http://www.syntaxscore.com/calc/start.htm). Thereafter, the SYNTAX score was divided into tertiles as low (≤16), intermediate (16-22), and high (>22). Also, patients were scored based on the modified lesion classification system of the American College of Cardiology/American Heart Association (ACC/AHA) which orders the treated lesions into four groups: A, B1, B2, and C. , In this classification system, lesions from type A to C become more complex. In order to facilitate statistical analysis, type A stenoses were translated as 1 point, type B1 stenoses as 2 points, type B2 stenoses as 3 points, and type C stenoses as 4 points. The mean of the modified ACC/AHA lesions classification within each tertile group was compared between the groups. Finally, the hazard ratio (HR) for predicting the incidence MACE was calculated. The PCI procedures and stent implantation were performed based on the standard techniques with the femoral approach. All patients received 300-600 mg loading dose of clopidogrel plus 325 mg aspirin before the procedure and 70-100 IU/kg intravenous unfractionated heparin during the procedure. Clopidogrel (75 mg/d) and aspirin (325 mg/d) were continued for at least 1-month. Then aspirin was tapered to 80 mg for lifelong use while clopidogrel was prescribed for a minimum of 1-month in BMS and 12 months in DES. In this study, CK-MB was measured at 6 and 12 h after the procedure. After 8 days from the intervention, MI was defined as abnormal Q-waves or cardiac enzyme elevation to diagnostic levels. TVR was defined as the revascularization of the vessel formerly treated via PCI during the index hospitalization through a repeat percutaneous intervention or bypass surgery. The incidence of MACE with the presence of other parameters of the patients as cofounders was then assessed in the SYNTAX score subgroups. MACE-free survival was defined as the time from the procedure to the time of occurrence of one the primary endpoints. Patients, who were alive and event-free at last follow-up were considered as censored observations. Continuous variables are presented as mean ± standard deviations and compared between the three groups of SYNTAX score using the one-way ANOVA test or the Kruskal-Wallis H-test, as appropriate. Categorical variables are presented as counts and percentages and were compared with the Chi-square test or the Fisher's exact test when appropriate. Survival curves were generated using the Kaplan-Meier method, and the log-rank test was employed to evaluate differences between the groups. Variables that were simultaneously associated with SYNTAX score and MACE with P 0< 0.2 were detected to act as potential confounders. Cox proportional hazards (PH) model was applied to assess the effect of SYNTAX score on MACE adjusted for potential confounders. Also, a Cox PH with backward elimination method was performed for finding independent predictors of MACE in the study population. Variables that had a P < 0.15 in the univariate analysis were included in the multivariable model. We reported the effects of variables through HRs and corresponding 95% confidence intervals (CI). The PH assumption was checked using the Chi-square test of the correlation coefficient between transformed survival time and the scaled Schoenfeld residuals. There was no violation from PH assumption in the multivariable Cox models. The survival package was used to check the PH assumption  and the R software version 3.0.0  (R foundation for statistical computing, Vienna, Austria) as well as the SPSS, version 15.0 (Chicago, Illinois, USA) were used to conduct statistical analyses. In this study, a total of 381 patients who underwent PCI and met our study criteria was included (mean age = 58.06 ± 10.06 years; 270 [70.8%] males). The sum of 153 (40.1%) patients received DES, 152 patients received BMS and in 76 patients both stents were used. The baseline clinical and angiographic characteristics of the studied population stratified across different SYNTAX levels are summarized in [Table 1] and [Table 2]. With regard to the baseline characteristics, the patients with higher SYNTAX score had significantly lower left ventricular ejection fractions ( P < 0.01) while the patients in the SYNTAX score tertile groups were similar in terms of demographics, general cardiovascular risk factors, and family history. Also, based on the procedural and angiographic characteristics, parameters pertinent to the complexity of CAD were more pronounced in the patients with the highest SYNTAX score. These included the number of lesions ( P < 0.01), number of total occlusions ( P < 0.01), diffuse ( P < 0.01), long ( P < 0.01), and proximal lesions ( P < 0.01) as well as lesions with severe tortuosity ( P = 0.01) or lesions at the bifurcation ( P < 0.01) or trifurcation ( P < 0.01). Contrary to this, the AHA/ACC classification scores were not different between the SYNTAX tertile groups. Regarding the incidence of MACE, 14 cases of TVR, 14 cases of MI, 17 cases of in-hospital MI, 3 cases of death and 2 cases of in-hospital death were observed. Overall, the frequency of MACE was 48 (12.6%) within a median follow-up of 14 months. The frequency of MACE was 10 (7.5%), 13 (9.9%), and 25 (21.6%) in patients with low, intermediate, and high SYNTAX scores, respectively ( P = 0.002). The MACE-free survival across the SYNTAX score tertiles and are shown in [Figure 1]. 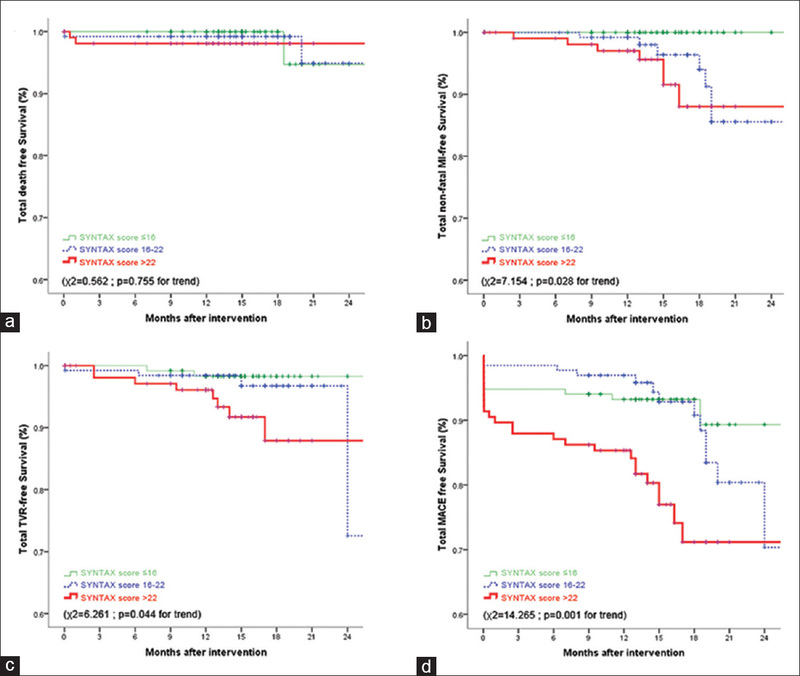 Predicting survival with a combination of death, TVR and MI showed a significantly different survival in the tertiles of the SYNTAX score ( P = 0.006). The 1-year MACE-free survival at each SYNTAX level was as follows: Low score: 98.4% (standard error [SE] =1.1); intermediate: 96.8% (SE = 1.6); and high: 93.9% (SE = 2.2; P = 0.002). Patients in the higher SYNTAX score tertile had a significantly higher risk for MACE (HR = 3.11, CI: 1.49-6.50; P = 0.002). After adjustment for EF and number of stented vessels, the association of the SYNTAX score and the MACE remained significant ( P = 0.001). In this model, higher SYNTAX score was significantly associated with a higher hazard for MACE (HR = 3.07, CI: 1.46-6.48; P = 0.003). In the multivariable Cox PH analysis [Table 3], the SYNTAX significantly predicted a higher risk of MACE in the highest tertile (HR = 2.368; 95% CI, 1.093-5.131; P = 0.029). These models showed that SYNTAX score as well as advanced age, hyperlipidemia, presentation as recent ST segment elevation MI, number of total lesions, and history of renal failure were predictors of a higher risk of MACE. On the contrary, AHA/ACC classification score could not predict MACE in the study population (HR, 0.96; 95% CI, 0.86-1.08; P = 0.53). Thus far, several studies have been performed to develop risk scores for PCI and compare different predictive tools. Despite the ability to estimate outcomes by each of these models, their implementation in clinical practice confronted some difficulties due to their limitations. These include various definitions of the included parameters, certain ethnic groups within each study that limits its generalizability, and limited data on their ability to predict long-term outcomes. Moreover, precise validation of every scoring system in different settings is necessary to achieve better results. Nonetheless, our study provides a good overview of the applicability of the SYNTAX score to predict MACE following PCI by comparison with the other routine practical scores. The SYNTAX score predicted the rate of MACE, with patients in the highest tertile showing a significantly higher event rate in MACE than do patients in the lowest tertile. The rate of MACE was significantly increased among patients in the highest SYNTAX score tertile (21.6%) as compared with those in the lowest SYNTAX tertile (7.5%) or intermediate SYNTAX tertile (9.9%). 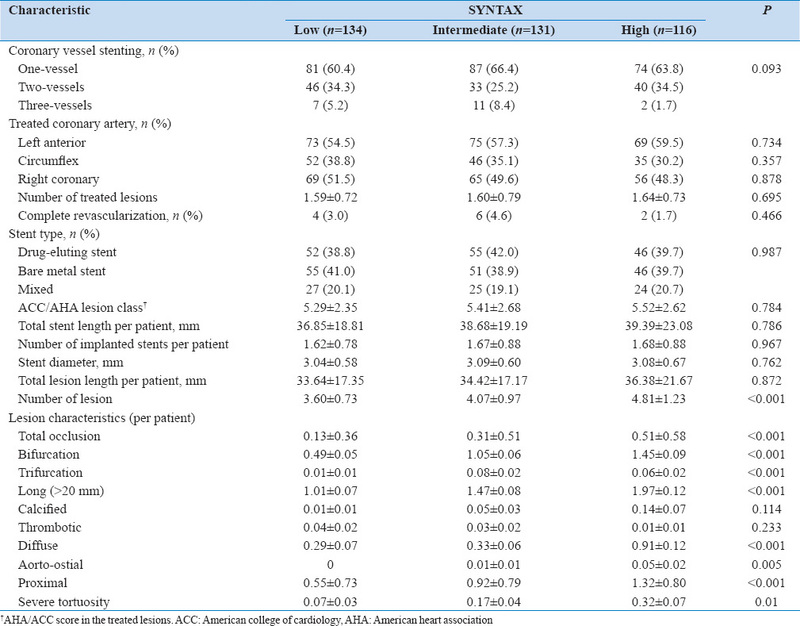 The rate of death, TVR and MI, without considering in-hospital events, also had a significant association with SYNTAX score. This result was also confirmed after adjustment for all potential confounders. It seems that SYNTAX score is a suitable tool to stratify outcomes of PCI in the context of multi-vessel disease. Moreover, higher SYNTAX indicative of more complex CAD, are assumed to represent a bigger therapeutic challenge and to have a potentially worse prognosis in patients with 3-vessel disease undergoing PCI. In this study, the modified AHA/ACC score was not significantly different between the SYNTAX levels and also could not predict MACE. A possible explanation for this finding may be the diverse nature of these two classification systems. The modified ACC/AHA score employs lesion morphology criteria that qualitatively assess angiograms,  whereas the SYNTAX score utilizes more detailed criteria that consists of twelve questions grading characteristics of the patient's CAD, which grade the complexity of each significant lesion such as the length, position, proximity to the junctions, calcification and tortuosity of each lesion. Determining the superiority of one of these systems on the other one was not the aim of this study; however, it has been demonstrated in one study that the area under the curve for the SYNTAX score was larger than that for the AHA/ACC score for MACE at 30 days. Meanwhile, the prognostic accuracy provided by the SYNTAX score was found to be significantly higher than that of the ACC/AHA classification in the same study. Nonetheless, the exact relationship between these two classification systems has yet to be fully elucidated. In patients who received both DES and BMS (mixed), the rate of MACE was lower than those who received DES. This may be due to the higher number of patients in a mixed group who underwent multi-vessel PCI and, therefore, had the better revascularization. As a limitation to this study, the duration of follow-up is the first and foremost. A longer period of follow-up would have increased the power for predicting the long-term MACE for the study population and would have made it possible to assess the impact of the SYNTAX scoring system on that basis. Moreover, having a control group of patients undergoing coronary artery bypass grafting would have enabled us to compare the predictive value of the SYNTAX score for selecting the proper revascularization strategy. Our findings suggest that the SYNTAX scoring model can play a major role in predicting mid-term outcomes following PCI in patients with three-vessel disease. Also, the SYNTAX score can be appropriately used for selecting the proper revascularization strategy in patients with three-vessel disease. However, it seems that adding such clinical factors, as age and renal failure can increase the predictive value of the SYNTAX score. Therefore, the next step would be a well-designed study to assess the predictive value of the clinical SYNTAX score on the MACE of patients undergoing PCI. The present study was supported by Tehran Heart Center and Tehran University of Medical Sciences. This work was the doctoral thesis of Dr. Hadi Safarian for obtaining a subspecialty degree in cardiology. The authors sincerely thank Dr. Kianoush Hoseini for his assistance in evaluating the angiograms and Dr. Hamid Reza Goudarzinejad for the initial preparations of this study. Serruys PW, Morice MC, Kappetein AP, Colombo A, Holmes DR, Mack MJ, et al. Percutaneous coronary intervention versus coronary-artery bypass grafting for severe coronary artery disease. N Engl J Med 2009;360:961-72. Cohen DJ, Van Hout B, Serruys PW, Mohr FW, Macaya C, den Heijer P, et al. Quality of life after PCI with drug-eluting stents or coronary-artery bypass surgery. N Engl J Med 2011;364:1016-26. Serruys PW, Lemos PA, van Hout BA, Arterial Revascularisation Therapies Study part II Steering Committee and Investigators. Sirolimus eluting stent implantation for patients with multivessel disease: Rationale for the Arterial Revascularisation Therapies Study part II (ARTS II). Heart 2004;90:995-8. Nafasi L, Rahmani R, Shafiee A, Salari A, Abdollahi A, Meysamie A. Can a high reloading dose of atorvastatin prior to percutaneous coronary intervention reduce periprocedural myocardial infarction? Curr Med Res Opin 2014;30:381-6. Kassaian S, Saroukhani S, Alaedini F, Salarifar M, Poorhosseini H, Lotfi-Tokaldani M, et al. A risk scoring model to predict in-hospital and one-year major adverse cardiac events after percutaneous coronary intervention. Eur Heart J 2013;34:P4835. Sianos G, Morel MA, Kappetein AP, Morice MC, Colombo A, Dawkins K, et al. The SYNTAX Score: An angiographic tool grading the complexity of coronary artery disease. EuroIntervention 2005;1:219-27. Carnero-Alcázar M, Maroto Castellanos LC, Silva Guisasola JA, Cobiella Carnicer J, Alswies A, Fuentes Ferrer ME, et al. SYNTAX Score is associated with worse outcomes after off-pump coronary artery bypass grafting surgery for three-vessel or left main complex coronary disease. J Thorac Cardiovasc Surg 2011;142:e123-32. Capodanno D, Di Salvo ME, Cincotta G, Miano M, Tamburino C, Tamburino C. Usefulness of the SYNTAX score for predicting clinical outcome after percutaneous coronary intervention of unprotected left main coronary artery disease. Circ Cardiovasc Interv 2009;2:302-8. Palmerini T, Genereux P, Caixeta A, Cristea E, Lansky A, Mehran R, et al. Prognostic value of the SYNTAX score in patients with acute coronary syndromes undergoing percutaneous coronary intervention: Analysis from the ACUITY (Acute Catheterization and Urgent Intervention Triage StrategY) trial. J Am Coll Cardiol 2011;57:2389-97. Salarifar M, Mousavi MR, Saroukhani S, Nematipour E, Kassaian SE, Alidoosti M, et al. Percutaneous coronary intervention to treat chronic total occlusion: Predictors of technical success and one-year clinical outcome. Tex Heart Inst J 2014;41:40-7. Salarifar M, Kassaian SE, Alidoosti M, Haji-Zeinali AM, Poorhoseini HR, Nematipour E, et al. One-year clinical outcomes of ultra long apollo polymer-based Paclitaxel-eluting stents in patients with complex, long coronary artery lesions. J Tehran Heart Cent 2011;6:138-42. Ryan TJ, Bauman WB, Kennedy JW, Kereiakes DJ, King SB 3 rd , McCallister BD, et al. Guidelines for percutaneous transluminal coronary angioplasty. A report of the American Heart Association/American College of Cardiology Task Force on Assessment of Diagnostic and Therapeutic Cardiovascular Procedures (Committee on Percutaneous Transluminal Coronary Angioplasty). Circulation 1993;88:2987-3007. Kastrati A, Schömig A, Elezi S, Dirschinger J, Mehilli J, Schühlen H, et al. Prognostic value of the modified american college of Cardiology/American heart association stenosis morphology classification for long-term angiographic and clinical outcome after coronary stent placement. Circulation 1999;100:1285-90. Smith SC Jr, Dove JT, Jacobs AK, Kennedy JW, Kereiakes D, Kern MJ, et al. ACC/AHA guidelines for percutaneous coronary intervention (revision of the 1993 PTCA guidelines)-executive summary: A report of the American College of Cardiology/American Heart Association task force on practice guidelines (Committee to revise the 1993 guidelines for percutaneous transluminal coronary angioplasty) endorsed by the Society for Cardiac Angiography and Interventions. Circulation 2001;103:3019-41. Silber S, Albertsson P, Avilés FF, Camici PG, Colombo A, Hamm C, et al. Guidelines for percutaneous coronary interventions. The Task Force for Percutaneous Coronary Interventions of the European Society of Cardiology. Eur Heart J 2005;26:804-47. Grambsch PM, Therneau TM. Proportional hazards tests and diagnostics based on weighted residuals. Biometrika 1994;81:515-26. Therneau TM. A package for survival analysis in S: Technical Report. Mayo Foundation; 1999. Available from: http://www.stat.ubc.ca/~rollin/teach/533/survival.pdfs. [Last accesssed on 2014 Dec 15]. Team RR. A Language and Environment for Statistical Computing. Vienna Austria: R Foundation for Statistical Computing; 2010. Alidoosti M, Salarifar M, Haji-Zeinali AM, Kassaian SE, Dehkordi MR, Fathollahi MS. Clinical outcomes of drug-eluting stents compared with bare metal stents in our routine clinical practice. Hellenic J Cardiol 2008;49:132-8. Alidoosti M, Salarifar M, Kassaian SE, Zeinali AM, Nematipoor E, Sheikhfathollahi M, et al. In-hospital and mid-term clinical outcomes after percutaneous coronary intervention with the use of sirolimus- or paclitaxel-eluting stents. Kardiol Pol 2009;67:1344-50. Poorhosseini H, Mousavi M, Nematipour E, Kassaian SE, Salarifar M, Alidoosti M, et al. Success rate, procedural complications and clinical outcomes of coronary interventions in octogenarians: A case-control study. J Tehran Heart Cent 2011;6:126-33. Singh M, Rihal CS, Lennon RJ, Garratt KN, Holmes DR Jr. Comparison of Mayo Clinic risk score and American College of Cardiology/American Heart Association lesion classification in the prediction of adverse cardiovascular outcome following percutaneous coronary interventions. J Am Coll Cardiol 2004;44:357-61. Valgimigli M, Serruys PW, Tsuchida K, Vaina S, Morel MA, van den Brand MJ, et al. Cyphering the complexity of coronary artery disease using the syntax score to predict clinical outcome in patients with three-vessel lumen obstruction undergoing percutaneous coronary intervention. Am J Cardiol 2007;99:1072-81. Brito J, Teles R, Almeida M, de Araújo Gonçalves P, Raposo L, Sousa P, et al. Predictive value of SYNTAX score in risk stratification of patients undergoing unprotected left main coronary artery angioplasty. J Invasive Cardiol 2011;23:494-9. Girasis C, Garg S, Räber L, Sarno G, Morel MA, Garcia-Garcia HM, et al. SYNTAX score and Clinical SYNTAX score as predictors of very long-term clinical outcomes in patients undergoing percutaneous coronary interventions: A substudy of SIRolimus-eluting stent compared with pacliTAXel-eluting stent for coronary revascularization (SIRTAX) trial. Eur Heart J 2011;32:3115-27. He JQ, Gao YC, Yu XP, Zhang XL, Luo YW, Wu CY, et al. Syntax score predicts clinical outcome in patients with three-vessel coronary artery disease undergoing percutaneous coronary intervention. Chin Med J (Engl) 2011;124:704-9. Kim YH, Park DW, Kim WJ, Lee JY, Yun SC, Kang SJ, et al. Validation of SYNTAX (Synergy between PCI with Taxus and Cardiac Surgery) score for prediction of outcomes after unprotected left main coronary revascularization. JACC Cardiovasc Interv 2010;3:612-23. Wilensky RL, Selzer F, Johnston J, Laskey WK, Klugherz BD, Block P, et al. Relation of percutaneous coronary intervention of complex lesions to clinical outcomes (from the NHLBI Dynamic Registry). Am J Cardiol 2002;90:216-21. Ischinger T, Gruentzig AR, Meier B, Galan K. Coronary dissection and total coronary occlusion associated with percutaneous transluminal coronary angioplasty: Significance of initial angiographic morphology of coronary stenoses. Circulation 1986;74:1371-8.